Store pesticides and herbicides on high shelves or inside locked cabinets, out of the reach of children. Chain saws: Make certain it is equipped with an anti-kickback chain that is well sharpened. Garden tools: Such as rakes, spades, forks, pruning clippers, files and metal plant stakes should not be left lying around when not in use. 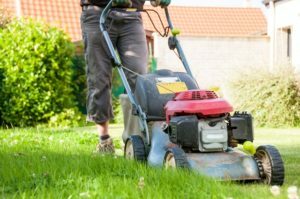 Prepare your lawn by walking over it, checking for broken sticks, stones, toys and anything else that could shoot out from under the mower – objects such as a rock or wire can be thrown 100-200 feet or further. Before you start your lawn mower for the first time, check to make sure that all guards are in place. Don’t let people stand or sit anywhere near where you are mowing. Keep small children away while the grass is being cut. Never reach under the mower unless it is turned off and the blade has stopped turning. Only refuel the mower after it has completely cooled down. Wear protective, close-fitting clothing and sturdy boots or shoes. Never wear open toe shoes or sandals. Never mow wet grass, especially when mowing slopes or berms.